San Sha, or 3 Killings, is a body of negative energy, whereby if you accidentally offend them, you will be in trouble. The 3 Killings comprise 3 types of Sha, namely, Robbery, Calamity and Year Sha. The notion of San Sha originates from San He school of feng shui although nowadays feng shui teachers do mention it in their feng shui courses as it is a must-know alongside with other undesirable afflictions like Tai Sui, Sui Po, 5 Yellow and etc. 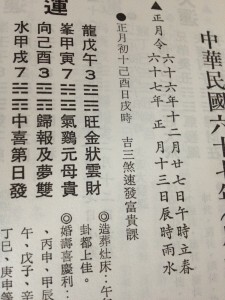 Even under San Sha, it can be further categorised as Spatial San Sha and what I call the Tong-Shu (Chinese Almanac) San Sha. The former focuses on the fact that if one is going to carry out renovation or construction work, the sitting direction of the house should avoid having conflict with the annual San Sha. The latter is meant for auspcious date selection purpose. In this instance, the date selected for the purpose of feng shui activities should not be in conflict with the month earthly branch. Example, if your house is sitting in the East sector, you should not carry out renovation work this year as your house violates the san sha. Okay, up to this point, what I have mentioned are what you will learn in San He school. The late Grand Master Zeng Zi Nan, who coined the term Xie Zi Fa and a guru in San Yuan, often used such San Sha dates and even San Sha hours to usher in wealth. 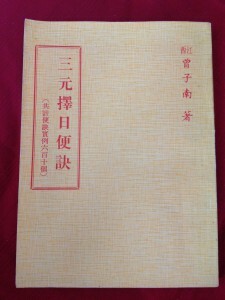 He called this the “Auspicious San Sha Quick Wealth Date” 吉三煞速发日课. In gist, if you notice, such days actually belong strictly to the graveyards/storage branches. I will not go in depth into the usage of this technique because it entails some calculations which I would normally teach in Xuan Kong Da Gua class. It is dangerous if you use the wrong San Sha day and hour. To reveal a bit more, one have to look at Personal San Sha branch based on your bazi and how it interacts with Xuan Kong Da Gua date struture. Not all San Sha days as mentioned here can be used especially if it is not personalised to your bazi. Instead of ushering quick wealth, backlash can happen. To sum it up, the san sha that we want to “fight” is not in the San He’s san sha that we commonly learn but it is the careful utilisation of San Yuan san sha. Disclaimer: I am not specially biased towards either San Yuan or San He because I learn and embrace both. You see, at the end of the day, San Yuan and San He overlap and converge. In the more advance practice of San Yuan Feng Shui, San He’s 12 Growth Stages Water Method comes into picture too.